Since 2008, Skule™ Society has honoured donors whose commitment to the vision and leadership of the Faculty of Applied Science & Engineering has enabled the Faculty to achieve prominence in Canada and the world. Skule™ Society is a unique membership program that allows the Faculty to maintain close relationships with its alumni, students, parents and friends. Through the generous gifts of our members, the Faculty is able to support deserving students, attract world class lecturers, improve student resources and program, and aid a myriad of initiatives that are the cornerstone of U of T Engineering’s boundless global impact. Membership in Skule™ Society is based on annual combined donations totalling $1,000 or more, or in the case of students or Graduates Of the Last Decade (GOLD), annual gifts totalling $250 or more. 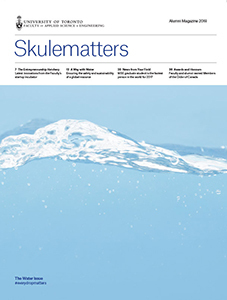 For more information, please view our Skule™ Society brochure.